In the 1940s, harbor porpoise were among the most frequently sighted cetaceans in Puget Sound, but by the early 1970s they had all but disappeared from local waters. Their numbers have since increased, but they remain a Species of Concern in the state of Washington. This in-depth profile looks at harbor porpoise in the Salish Sea, and was prepared by the SeaDoc Society for inclusion in the Encyclopedia of Puget Sound. Harbor porpoise (Phocoena phocoena) are the smallest of 22 cetaceans recorded in the Salish Sea and are probably one of the few that are resident year-­‐round (Gaydos and Pearson 2011, Osborne et al. 1988, Scheffer and Slipp 1948). Excluding the Arctic, their distribution extends throughout the Northern Hemisphere. Phocoena phocoena vomerina is the subspecies found in the North Pacific, including the Salish Sea. Their subdued coloration is typically dark gray to brown dorsally and shades into white ventrally (Scheffer and Slipp 1948). Weighing less than 100 kg and spanning less than 2 m long, harbor porpoise sit low in the water and barely brush the water’s surface to breathe. Observers rarely glimpse more than their back and small, uniformly colored dorsal fin, which has a longer leading than trailing edge (Allen et al. 2011). 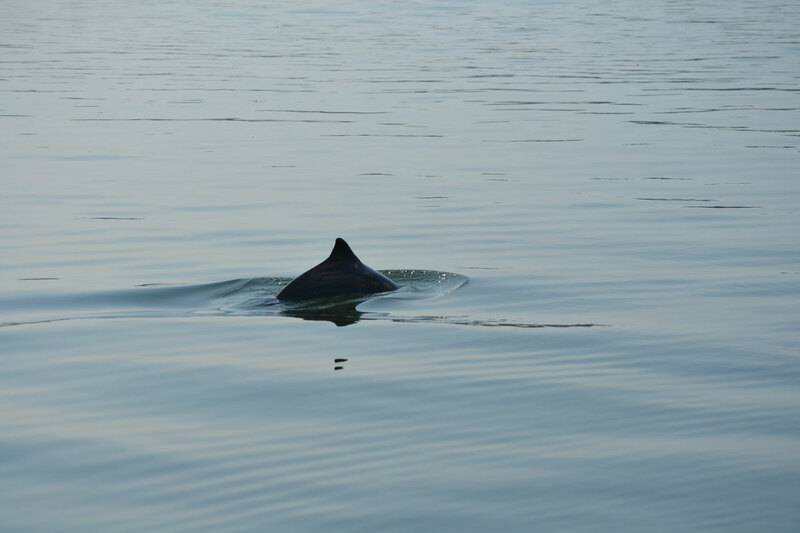 They can be confused with Dall’s porpoise (Phocoenides dallii), small, stockier porpoises that are black with white flanks along the belly and white tipped dorsal fins and flukes (Allen et al. 2011). They could also be mistaken for Pacific white-­‐sided dolphin (Lagenorhynchus obliquidens), which have similar gray backs but complex white stripes on their sides, a bi-­‐colored and more curved dorsal fin, and more exuberant, social behavior, generally travelling in larger groups and often leaping from the water completely. Zier, J.C. and Gaydos, J.K. (2015). Harbor Porpoise in the Salish Sea A Species Profile for the Encyclopedia of Puget Sound. Encyclopedia of Puget Sound. 32 pgs.